There’s a reason the #1 selling Pedego electric bike in Canada is the City Commuter: this bike has it all! Whether you’re commuting the streets of cities such as Ottawa or Vancouver or you’re gliding down country lanes in New Brunswick or Alberta, this electric bike is the complete package and all for a reasonable price. It’s interesting to note that the flashier, cruiser-style Interceptor is the most popular electric bike in the United States. Perhaps it’s because there are more beaches to cruise there. 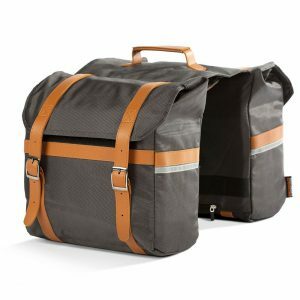 But here in Canada, we prefer the City Commuter: practical, stylish, and can go the distance… just like us Canadians! Unique to the City Commuter is a quick release handlebar stem that allows you to easily make adjustments for a perfect fit. A soft, luxurious saddle with a suspension seat post provides plenty of cushioning where it matters most. And premium balloon tires give you a nice, smooth ride. 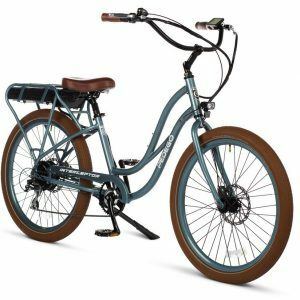 28″ Classic City Commuter – The standard model with a higher crossbar and 28-inch-diametre tires. 28″ Step Thru City Commuter – Like the above except with a lower crossbar that’s easy to step over. 26″ Step Thru City Commuter – Like the above except with 26-inch-diametre-tires. City Commuter Mid-Drive Edition – This City Commuter is available in all the styles above but comes with a powerful mid-drive motor. City Commuter Black Edition – This is the luxury edition that comes in standard, step-thru, 28″ and 26″ versions but is fully loaded with features and premium upgrades from hydraulic brakes to front suspension. The beautiful and fully-loaded 28″ Step-Thru City Commuter Black Edition. While it’s nice to be comfortable, what really sets the City Commuter apart is it’s supercharged performance. It can climb hills like nobody’s business, cover plenty of distance, and it’s just plain fun and exciting to ride. A state of the art motor delivers best in class acceleration and hill climbing. The sensation of power it gives you is exhilarating. The battery is lightweight and long lasting. It uses Samsung cells with cutting edge lithium-ion technology and a two-year warranty. In summary, the Pedego City Commuter is Canada’s best-selling Pedego electric bike and it’s easy to see why. It’s widely considered to be the very best all-around electric bike you can get – for any price. We invite you to find a dealer and take a free test ride today. Discover for yourself all the joy of riding a Pedego City Commuter electric bike.